You are browsing the archive for classic boat restoration. … Lots of projects on the go at Stan Hunter’s boat shop. A late January visit to Stan Hunter, Boat Builder, on Milford Bay, Lake Muskoka, uncovered some tantalizing restoration projects. A 1930’s Swiss sailboat, a W.J. Johnson runabout and of course, Stan’s fleet of Duke Playmates for hire are receiving some tender loving care from this master boat builder. See what’s cooking at Stan’s in the video below. Tags: ACBS, antique boat restoration, antique boats, antique wooden boats, boat builder, classic boat restoration, classic boats, classic wooden boats, Duke Playmate, Port Carling Boats, Stan Hunter, vintage boats, W.J. Johnson runabout, wooden boats, woody boater, www.portcarlingboats.com Comments Off on … Lots of projects on the go at Stan Hunter’s boat shop. This video (Part III) completes the series on the Antique and Classic Boat Society”s (Toronto Chapter) Spring Tour of Muskoka boat shops. This segment focuses on projects underway at Duke Boats, as well as Tom Adams and James Osler’s facilities. All three shops are located in the Port Carling, Ontario area. Enjoy! Wooden boating on a Beer budget? A close inspection under the glued and stapled, wall-to-wall carpeting (ugh!) revealed major problems. 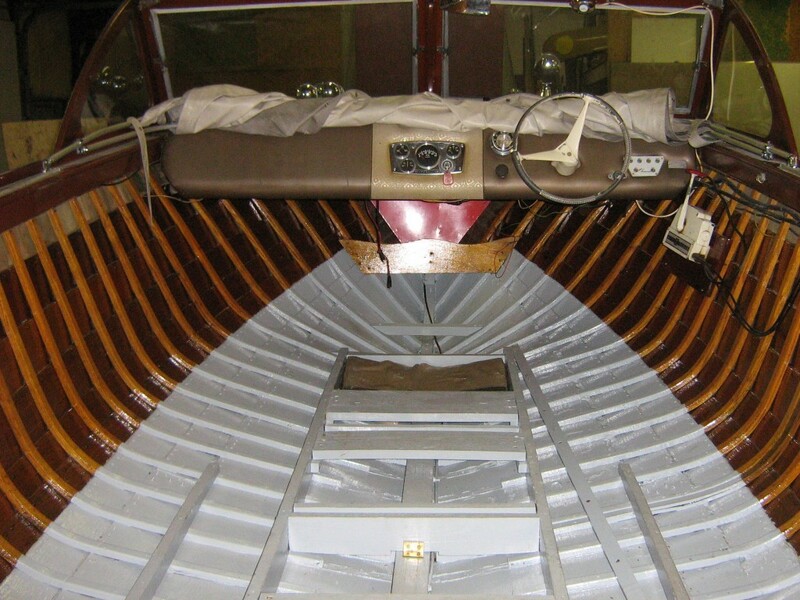 The restorative work required included fifteen new sistered ribs, three new bottom planks and an interior keel. The engine had to be removed, and later reinstalled with a somewhat newer outdrive with hydraulic lift. Fortunately, the engine itself required no major overhaul. Incidental costs included a new battery, and bilge pump. The trailer itself required new tires,rims and bearings, an electric trailer winch and repairs to the frame and fenders, as well as new guide bars. Considering the cost of a new fibreglass boat, it doesn’t seem too horrendous a price to pay! Enjoy the video below.